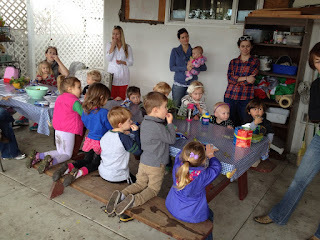 On Monday, January 7 we held our 2013 Kick-off Playdate with a Purpose. Our hope was to teach kids about money with a "Save Spend Share" bank. At the end of this year, we hope to hold a Year-end Party where the kids can open their "Share" banks and choose to make donations to a few local charities. SESLOC Credit Union generously donated some “Moonjar” three-part cardboard banks with "Save," "Spend," and "Share" sections. There are similar ideas online including those below. We were also blessed with a musical performance from Heidi Harmon of Boo Boo Records fame!! Thank you Ms. Heidi! A "Love and Logic" teacher once suggested that young kids be given an allowance at an early age, as soon as kids can understand the concept of saving, spending, and sharing. There are many thoughts on how to structure allowances, and we encourage you to find a system that works for your family.